(CNN) -- Western powers slapped sanctions on more than two dozen Russian officials and their allies in Ukraine's Crimea region on Monday, while Ukrainian officials vowed they would never accept the territory's annexation by Russia. In a televised address Monday night, interim Ukrainian President Oleksandr Turchynov said his government would do "everything possible" to solve the crisis diplomatically, and he praised his citizens for refusing to respond to Russian provocations with violence. "The Kremlin is afraid of the democratic future which we are building, and this is the reason for their aggression," Turchynov said. "But this will not be an obstacle to the building of a democratic country." But he announced a partial mobilization of his country's armed forces and said Ukrainians "have to unite in one big family, which is ready to protect its home." Prime Minister Arseniy Yatsenyuk said there was "a strong possibility" of a Russian invasion of Ukraine. 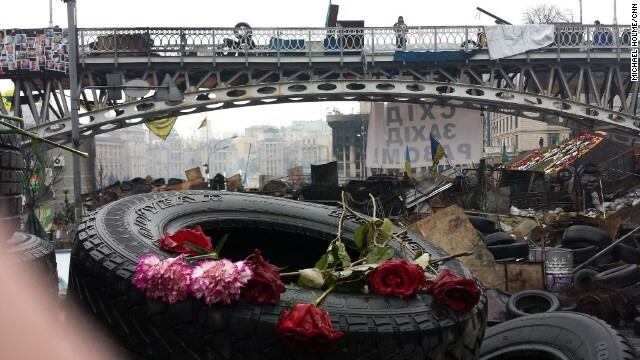 "I still believe that there is only one solution of this crisis, a peaceful one," Yatsenyuk said. 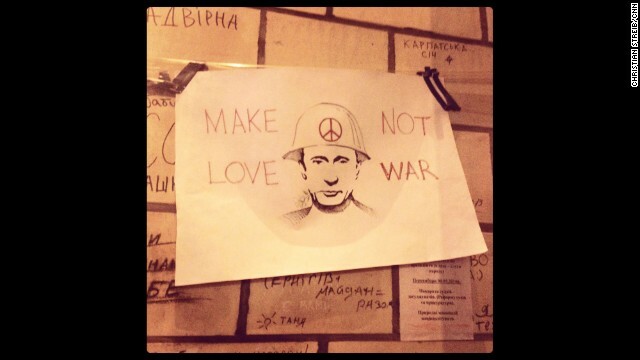 "But we offer peace, and Russia offers war." In Moscow, Russian President Vladimir Putin signed a decree that recognizes the independence and sovereignty of the Republic of Crimea, says a statement on Russia's Kremlin website. The Russian parliament is expected to vote on whether to annex the breakaway territory in the coming days. Turchynov said Ukraine was willing to hold talks with Russia, "but we will never accept the annexing of our territory." In Washington, President Barack Obama warned Moscow: "Further provocations will achieve nothing except to further isolate Russia and diminish its place in the world." "The international community will continue to stand together to oppose any violations of Ukrainian sovereignty and territorial integrity, and continued Russia military intervention in Ukraine will only deepen Russia's diplomatic isolation and exact a greater toll on the Russia economy," he said. Washington said its sanctions targeted Russian officials and lawmakers, as well as Crimea-based separatist leaders, with financial sanctions for undermining "democratic processes and institutions in Ukraine." Obama's order freezes any assets in the United States and bans travel for the 11 people named. 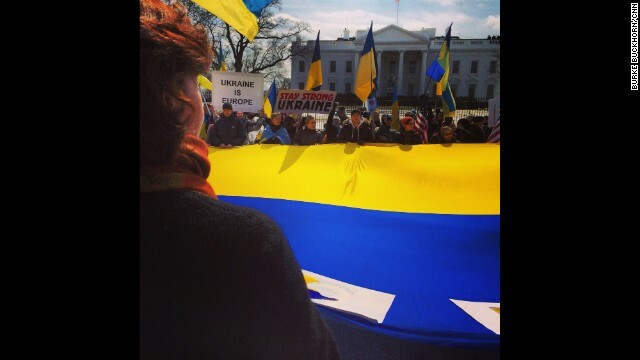 Among those sanctioned were ousted Ukrainian President Viktor Yanukovych and aides to Putin. But one of the Putin aides named in the U.S. sanctions called it "a great honor" to be singled out for American punishment. "I consider the decision of the Washington administration as a recognition of my service to Russia," Vladislav Surkov told Russian news outlet MK. And in Brussels, Belgium, European Union international policy chief Catherine Ashton announced sanctions against 21 people "responsible for actions which undermine or threaten the territorial integrity, sovereignty and independence of Ukraine." She called the weekend vote "illegal" and "a clear breach of the Ukrainian Constitution," and she urged Russia not to follow up by annexing the territory. "We want to underline very clearly that there is still time to avoid a negative spiral and to reverse current developments," she said. Diplomatically, Sunday's referendum has put the United States and Russia on the kind of collision course not seen since the Cold War. Economically, it's unclear how much such a coupling will cost Russia. "These are pinpricks," Russian journalist and CNN analyst Vladimir Pozner said of Monday's sanctions. Some officials won't be able to travel to the United States, but they "probably won't lose a lot of sleep over it," he told CNN's "The Lead with Jake Tapper." But Sen. Chris Murphy, D-Connecticut, said the sanctions will show Putin that if Russia annexes Crimea, "This is just the beginning of sanctions, not the end." 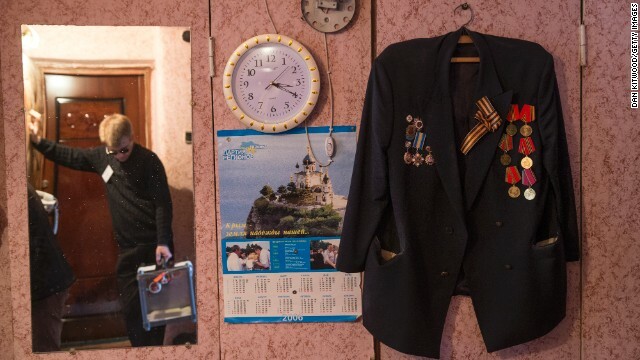 A woman leaves a voting booth in Sevastopol, Ukraine, on Sunday, March 16. 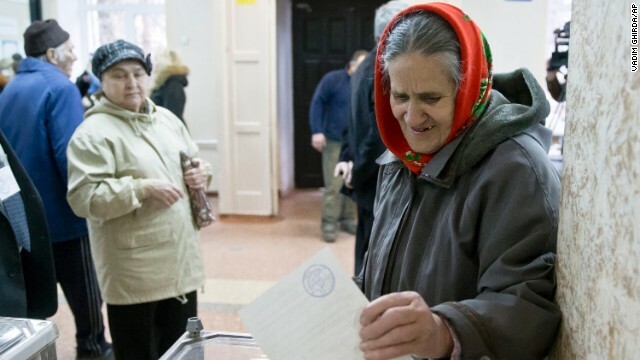 Polls opened Sunday morning in a referendum in Ukraine's Crimea region, in which voters are to voice their wish to either join Russia or become an effectively independent state connected to Ukraine. 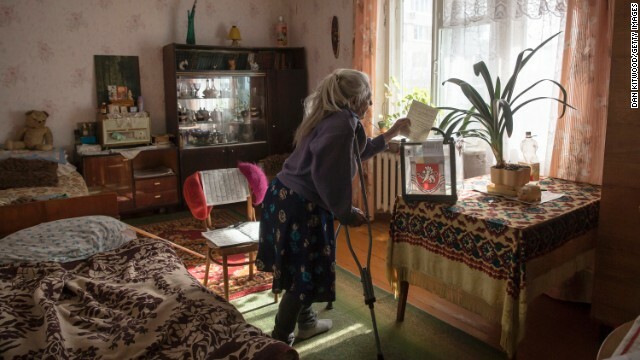 Solodkova Natalia, who was not healthy enough to visit a polling station, casts her vote at her home in Bakhchysaray, Ukraine, on March 16. 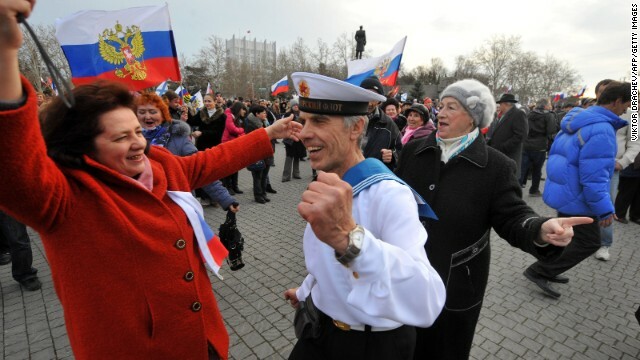 Pro-Russian Crimeans dance as they celebrate in Sevastopol, Ukraine, on March 16. 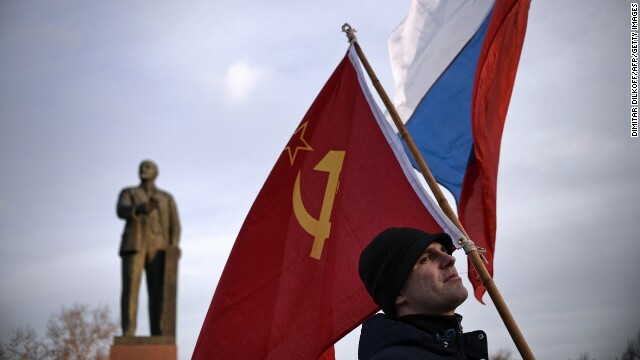 A Crimean man holds a Soviet Union flag in Lenin Square in Simferopol, Ukraine, on March 16. A man holds a ballot after casting a vote in favor of separation from Ukraine in the Crimean referendum in Simferopol, Ukraine, on March 16. 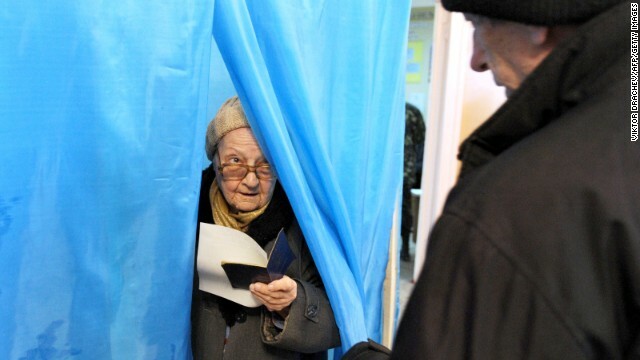 Referendum staff wait to collect the vote of WWII veteran Grinevich Oleksander in Bakhchysaray, Ukraine, on March 16. 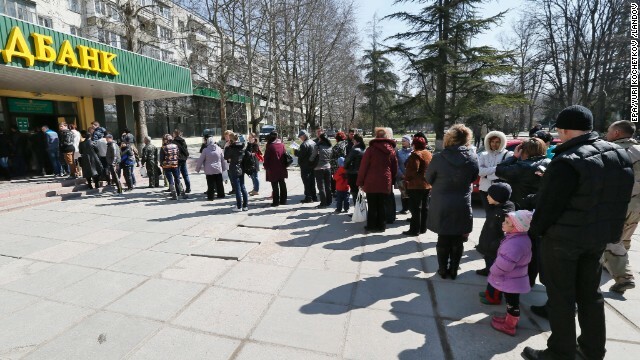 People stand in line to vote at a bank office in Simferopol, Ukraine. Results are expected on Monday. The United States has already said it expects the Black Sea peninsula's majority ethnic Russian population to vote in favor of joining Russia. People sign up to receive their ballots from electoral staff at a polling station in Sevastopol. 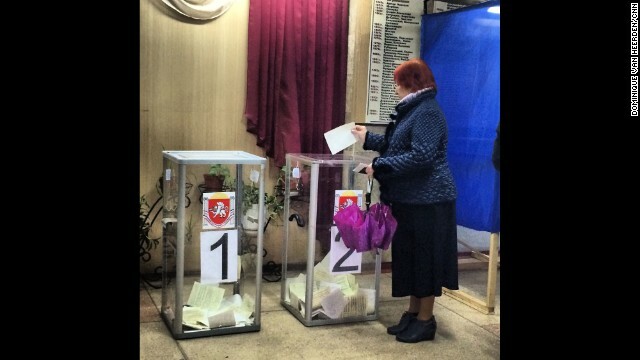 A woman casts her ballot in the Crimean referendum in Simferopol. 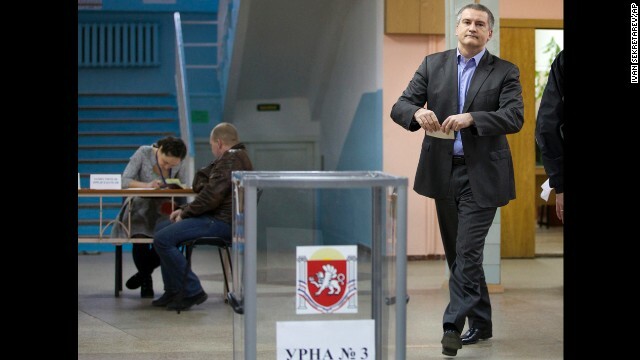 The newly installed pro-Russian leader of Crimea, Sergey Aksyonov, casts his ballot at a polling station. 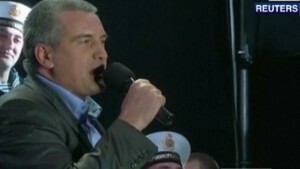 He called on the residents of Crimea to cast their votes "independent of nationalism and disintegration." 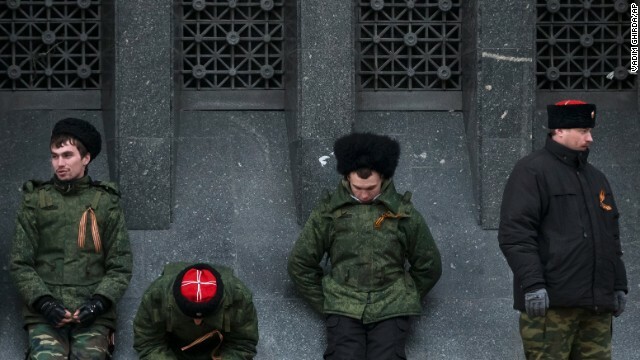 Cossacks guard the regional parliament building during the Crimean referendum in Simferopol. 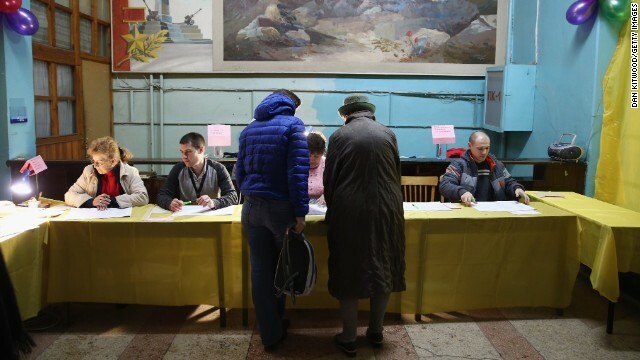 Voters talk to election officials inside a polling station in Simferopol. 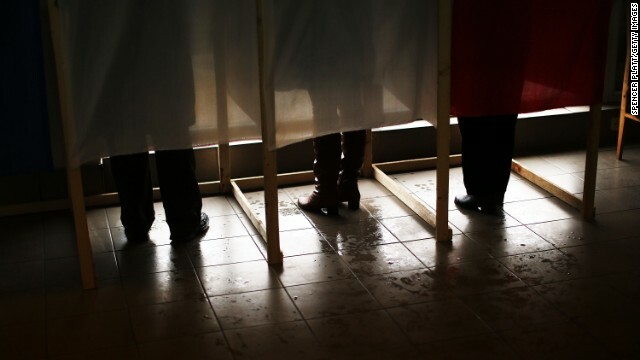 People vote inside a polling station in Simferopol. If the vote goes in favor of joining Russia, Crimea's government will declare its independence and ask Moscow to let it join the Russian Federation. SLOVYANSK, UKRAINE: "Welcome to Balaclavistan! 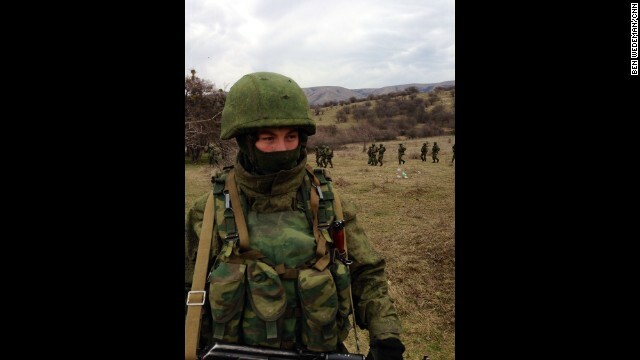 This happy chap wouldn't say if he's Crimean, Russian or Ukrainian." - CNN's Christian Streib. Follow Christian on Instagram at instagram.com/christianstreibcnn. 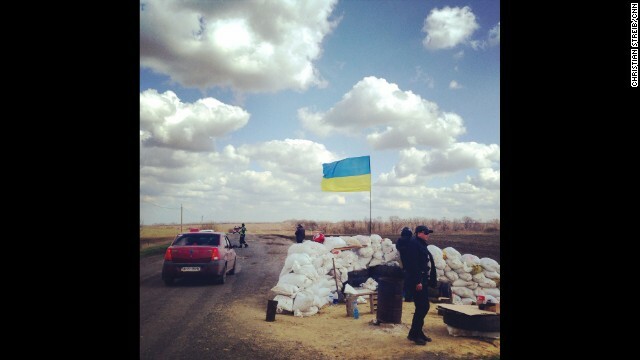 EASTERN UKRAINE: "Ukrainian Police checkpoint north of Donetsk. A rare sight these days in Eastern Ukraine." - CNN's Christian Streib, April 15. Follow Christian on Instagram at instagram.com/christianstreibcnn. 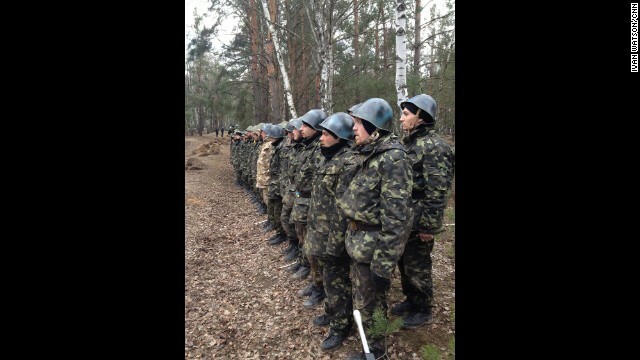 NEAR KIEV, UKRAINE: "Fresh recruits to Ukraine's National Guard Reserves (March 20). 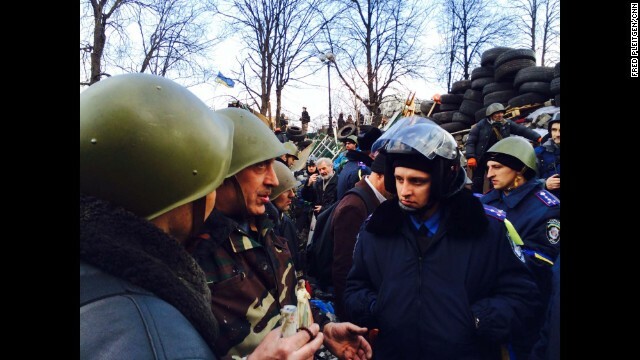 All of them are former anti-government militiamen from Kyiv's Maydan. 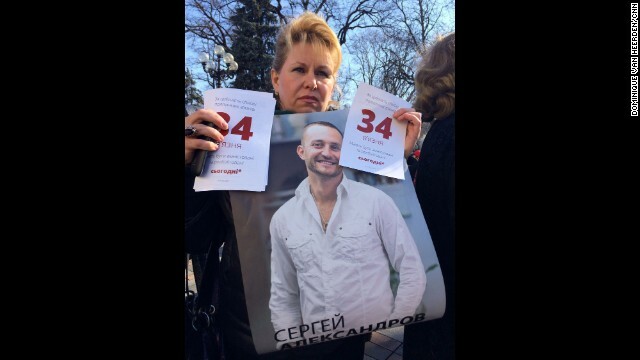 They've all signed up within the last week as part of a mass recruitment program announced by the interim Ukrainian government." - CNN's Ivan Watson. WATCH THE INSTAGRAM VIDEO from Ivan of a curious "hand grenade" simulation exercise performed by new Ukrainian National Guard reserve recruits. 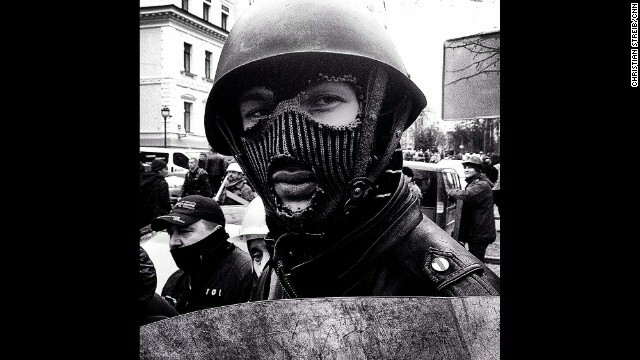 Follow Ivan on Instagram at instagram.com/ivancnn. 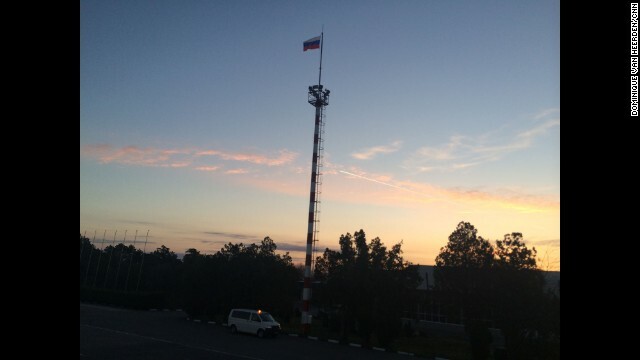 SIMFEROPOL, CRIMEA: "Early morning departure (March 19) at Simferopol airport where the Russian flag is already firmly in place on the tarmac." - CNN's Dominique Van Heerden. Follow Dominique on Instagram at instagram.com/dominique_vh. 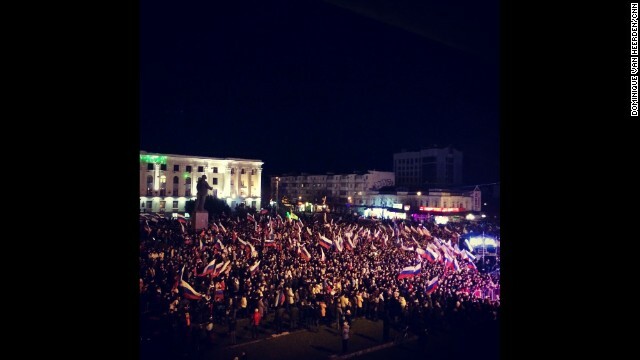 SIMFEROPOL, UKRAINE: "Celebrations already well underway here in Lenin Square in Simferopol (March 16)." - CNN's Dominique Van Heerden. Follow Dominique on Instagram at instagram.com/dominique_vh. 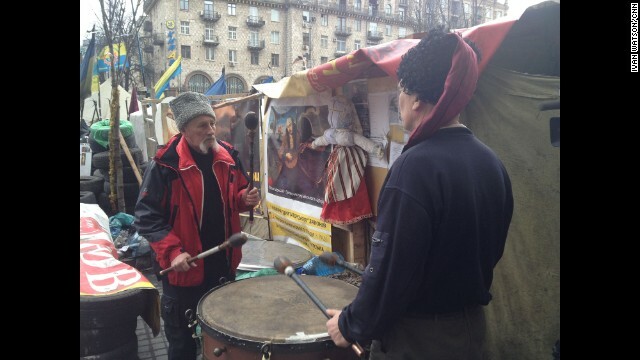 KIEV, UKRAINE: "The mood was grim in Kyiv's Maydan (March 16), as a mustachioed Ukrainian Cossack beat a kettle drum during the separatist referendum in Crimea." - CNN's Ivan Watson. WATCH THE INSTAGRAM VIDEO Follow Ivan on Instagram at instagram.com/ivancnn. 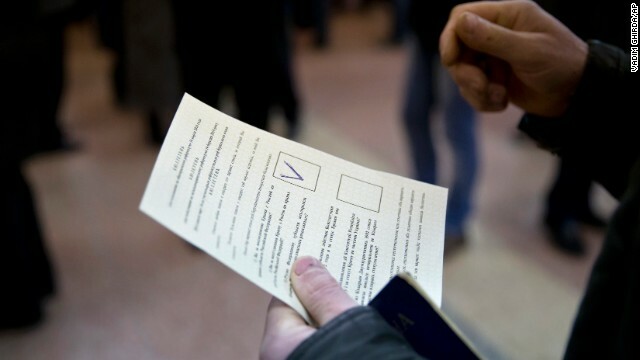 SIMFEROPOL, UKRAINE: "Voting has started in Crimea (March 16). Steady stream of voters at this polling station in the center of Simferopol." - CNN's Dominique Van Heerden. Follow Dominique on Instagram at instagram.com/dominique_vh. 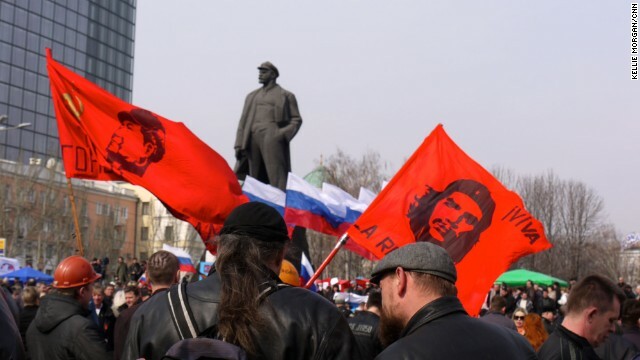 DONETSK, UKRAINE: Demonstrators wave revolutionary flags at a major pro-Russia rally in Lenin Square in central Donetsk (March 15). 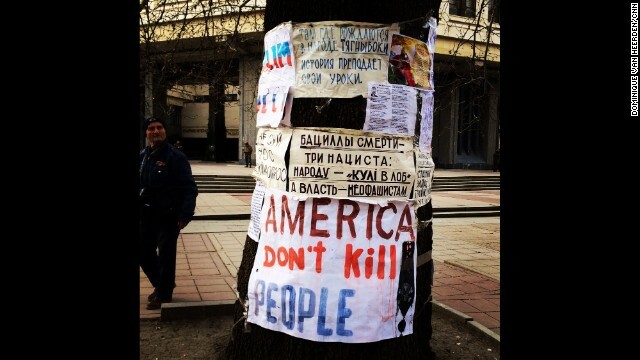 Some are calling for independence from Ukraine. Others are calling for union with Russia. Photo by CNN's Kellie Morgan. 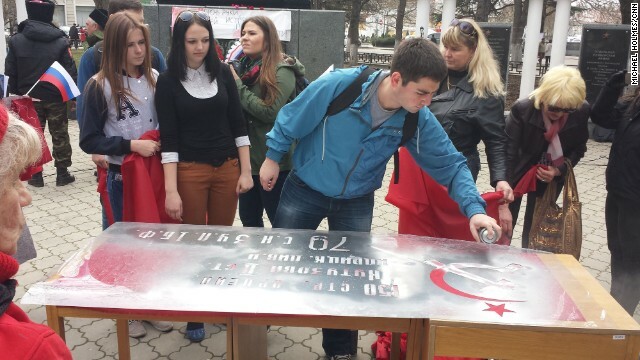 SIMFEROPOL, UKRAINE: "Pro-Soviet flags being made and handed out in Simferopol on March 14." - CNN's Michael Holmes. Follow Michael on Instagram at instagram.com/holmescnn. 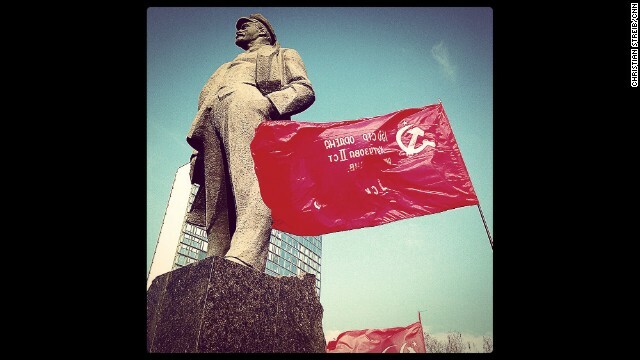 DONETSK, UKRAINE: "Dominating the main square named after him: Vladimir Ilyich Ulyanov, also known as Lenin" - CNN's Christian Streib. Follow Christian on Instagram at instagram.com/christianstreibcnn. 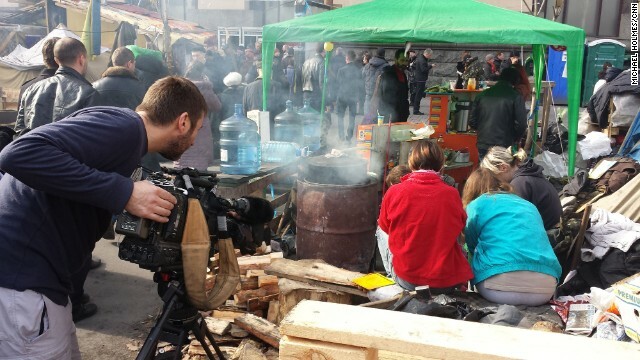 KIEV, UKRAINE: CNN cameraman Scott McWhinnie films volunteers peeling vegetables, preparing meals for protesters still living in tents in Maidan, also known as Independence Square, on March 9. Photo by CNN's Michael Holmes. Follow Michael on Instagram at instagram.com/holmescnn. 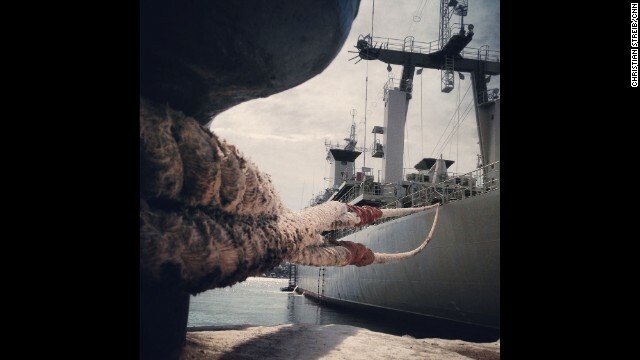 SEVASTOPOL, UKRAINE: The Ukranian Navy vessel Slavutych remains blocked by Russian Navy boats inside the Port of Sevastopol on March 10, photographed by CNN's Christian Streib. Follow Christian on Instagram at instagram.com/christianstreibcnn. 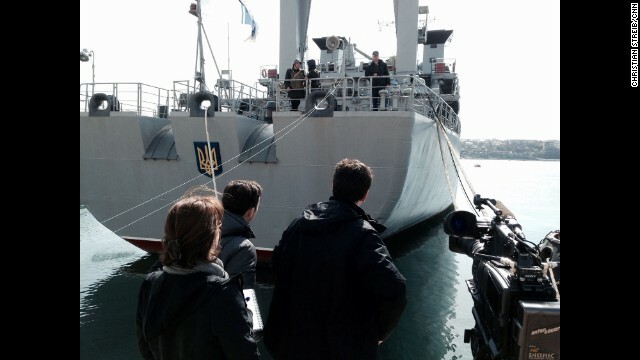 SEVASTOPOL, UKRAINE: "CNN's Matthew Chance and team talk to the first officer of the Ukrainian Intelligence Navy ship Slavutych inside the Port of Sevastopol on March 10." - CNN's Christian Streib. Follow Christian on Instagram at instagram.com/christianstreibcnn. 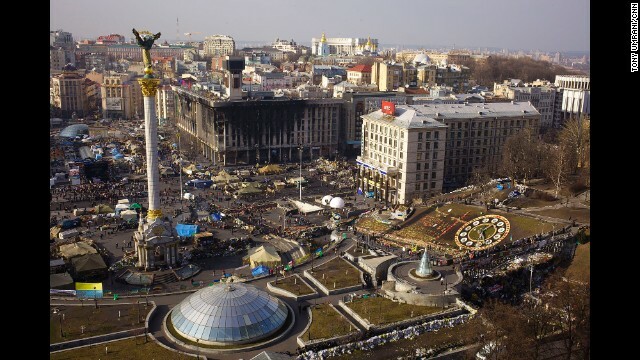 KIEV, UKRAINE: An aerial photo of Independence Square, or Maidan, in Kiev on March 8. Many remain camped out in Independence Square, while others stream through the area to pay tribute to those who were killed. Photo by CNN's Tony Umrani. 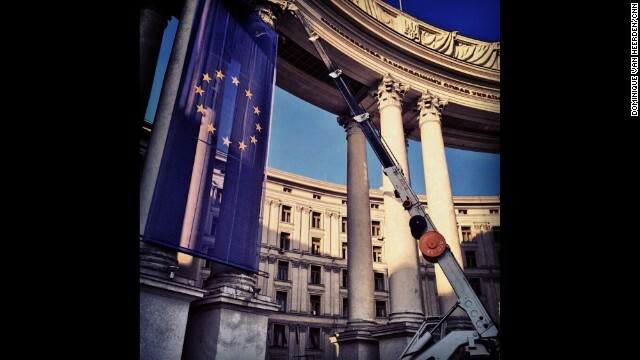 KIEV, UKRAINE: A giant EU flag is hung outside the foreign ministry building in Kiev on March 7. Photo by CNN's Dominique Van Heerden. Follow Dominique on Instagram at instagram.com/dominique_vh. 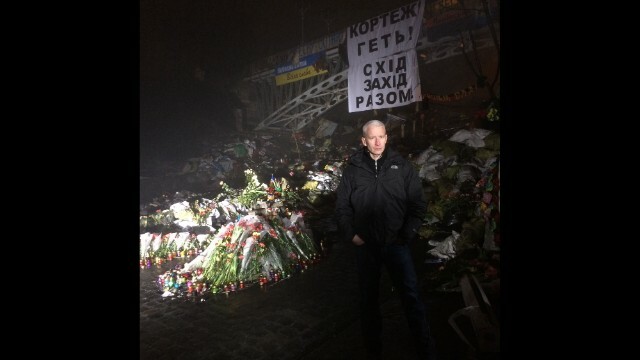 KIEV, UKRAINE: CNN's Anderson Cooper reports from Kiev's Independence Square on March 6. Photo by CNN's Khalil Abdallah. 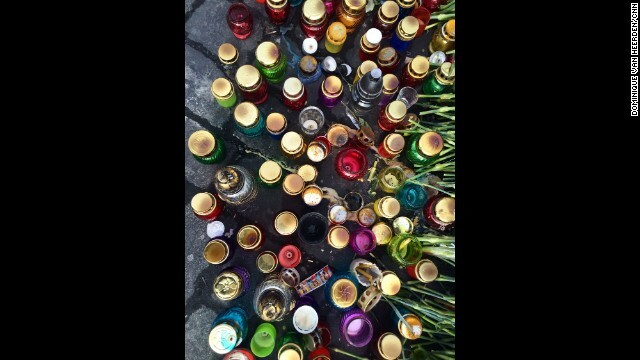 KIEV, UKRAINE: Portraits of people killed during clashes with riot police are left with candles and flowers at Kiev's Independence Square on March 6. Photo by CNN's Michael Holmes. Follow Michael on Instagram at instagram.com/holmescnn. 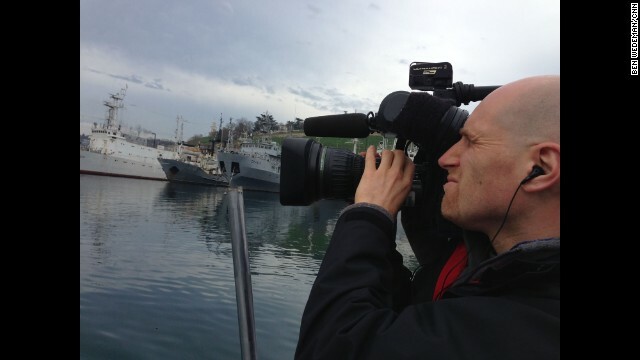 SEVASTOPOL, UKRAINE: Cameraman Chris Jackson captures the Russian Black Sea fleet in Sevastopol on March 5. Photo by CNN's Ben Wedeman. Follow Ben on Instagram at instagram.com/bcwedeman. 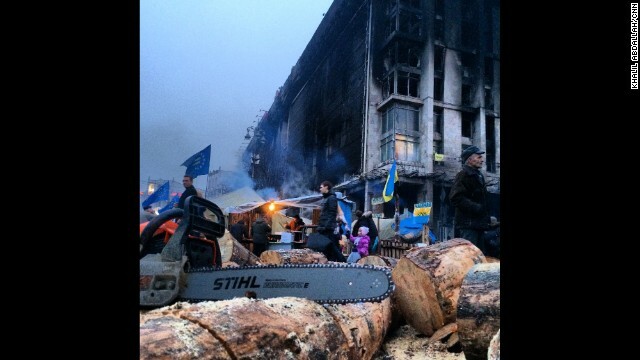 KIEV, UKRAINE: "Cutting wood to keep volunteers warm as they continue to guard Independence Square in Kiev." - CNN's Khalil Abdallah on March 5. Follow Khalil on Instagram at instagram.com/madcameraman. 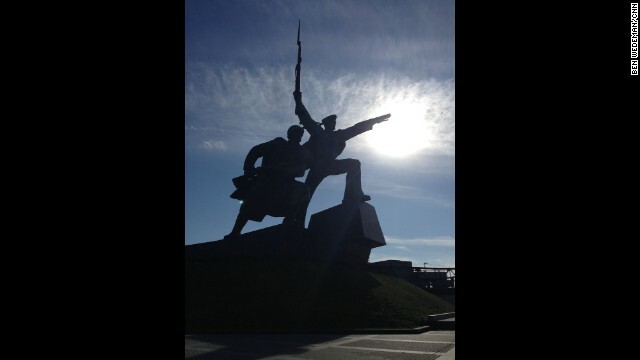 SEVASTOPOL, UKRAINE: "A massive statue on a hill overlooking Sevastopol, dedicated to the unity of the Soviety army and navy during World War II. After a brutal 250-day siege by German forces, Sevastopol fell in 1942. The past weighs heavily here, with an intense awareness of history, of identity, of place." - CNN's Ben Wedeman. Follow Ben on Instagram at instagram.com/bcwedeman. 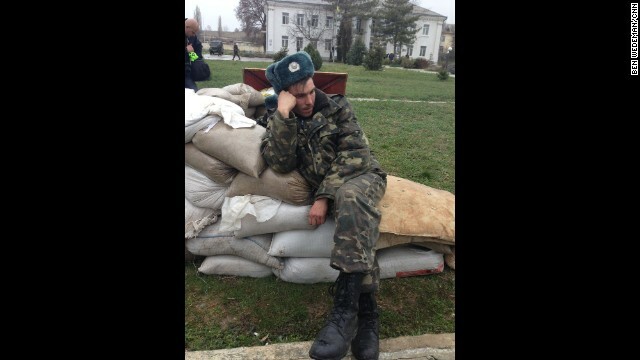 SEVASTOPOL, UKRAINE: "A weary Ukrainian soldier after a five-day standoff at the Belbak air base outside Sevastopol, Crimea, on March 5." - CNN's Ben Wedeman. Follow Ben on Instagram at instagram.com/bcwedeman. 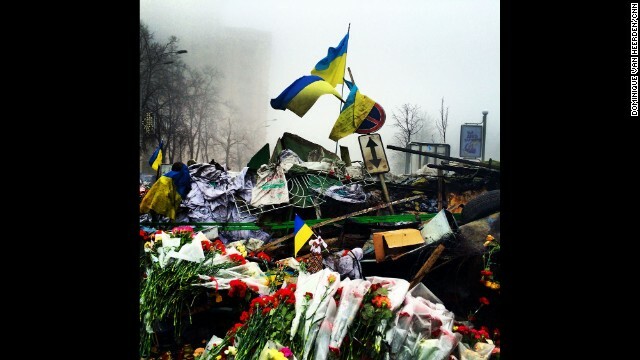 KIEV, UKRAINE: The Shrine of the Fallen on Institutska Street honors the "Heroes" killed in clashes with police. Photo on March 4 by CNN's Dominique Van Heerden. Follow Dominique on Instagram at instagram.com/dominique_vh. 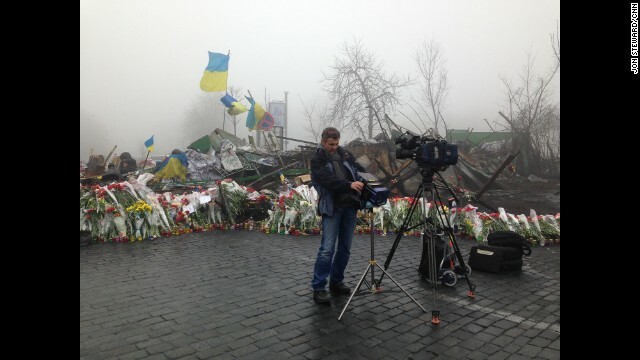 KIEV, UKRAINE: CNN Cameraman Christian Streib sets up for live shots by the barricades on the road to Independence Square on March 4. Photo by CNN's Jon Steward. KIEV, UKRAINE: "27-year old Bogdan sits on top of his Russian-made soup kitchen in Indepence -- or Maidan -- Square on March 2. 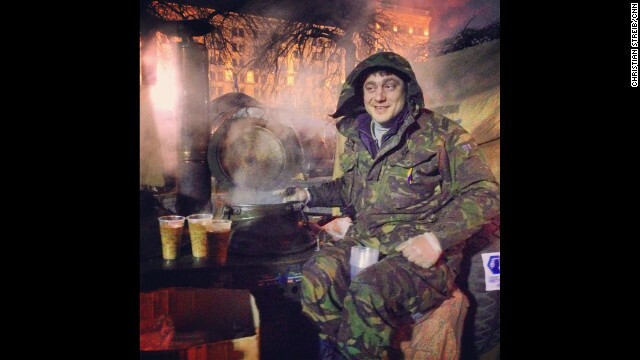 He's been sitting there for the last three months serving delicious Ukrainian grechaniy soup. It's made of buckwheat, lentil, coriander and beef. Amazing taste." - CNN's Christian Streib. Follow Christian on Instagram at instagram.com/christianstreibcnn. 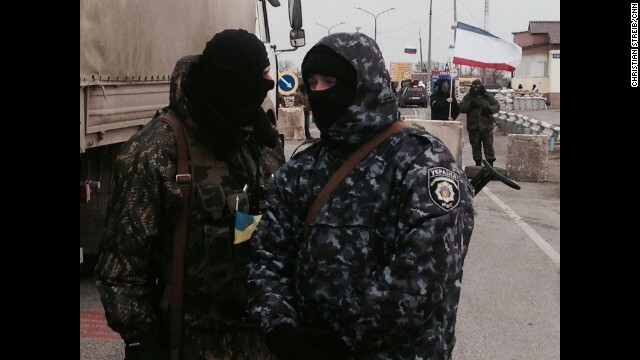 PEREVALNOYE BASE, UKRAINE: "Outside Ukrainian base in Crimea (March 2), tight-lipped but obviously Russian marines deploy around perimeter as Ukrainian soldiers inside vow not to surrender." - CNN's Ben Wedeman. Follow Ben on Instagram at instagram.com/bcwedeman. KIEV, UKAINE: "Perhaps the best solution to end the crisis in Ukraine." - CNN's Christian Streib on March 2. Follow Ben on Instagram at instagram.com/bcwedeman. 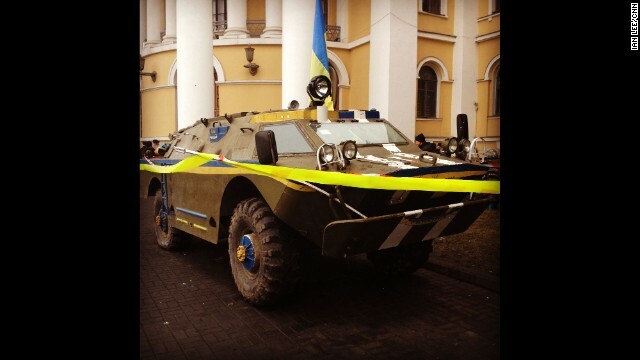 KIEV, UKRAINE: "APC in central Kiev (March 1). 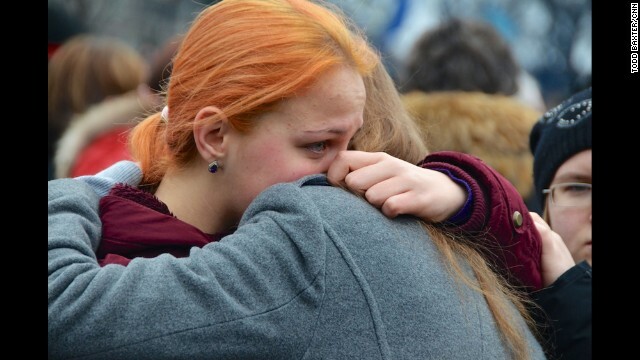 It appeared the morning after Russian forces moved into the Crimea." -- CNN's Ian Lee. Follow Ian on Instagram at instagram.com/ianjameslee. 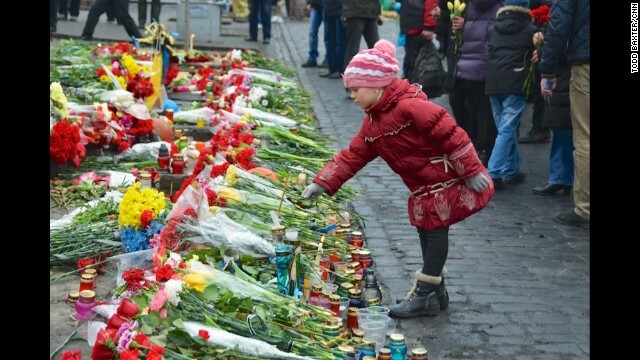 KIEV, UKRAINE: A young girl pays tribute to anti-government protesters killed in the clashes with riot police by placing a flower on a makeshift memorial leading to the barricades in central Kiev on February 24. Photo by CNN's Todd Baxter. KIEV, UKRAINE: A woman mourns at a makeshift memorial (February 23) in homage to anti-government protesters killed in clashes with riot police in Kiev's Independence Square. Photo by CNN's Todd Baxter. 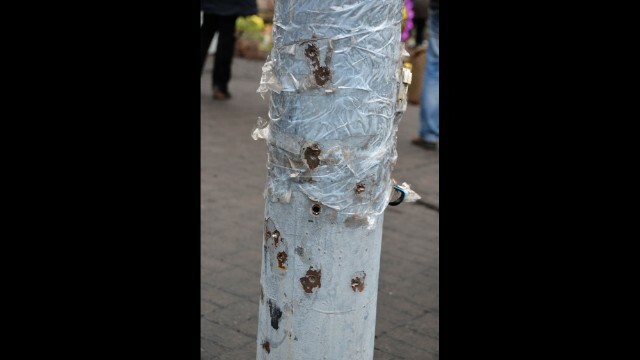 KIEV, UKRAINE: Bullet holes in a power pole at a spot where a protester was killed during clashes with riot police, near Independence Square. 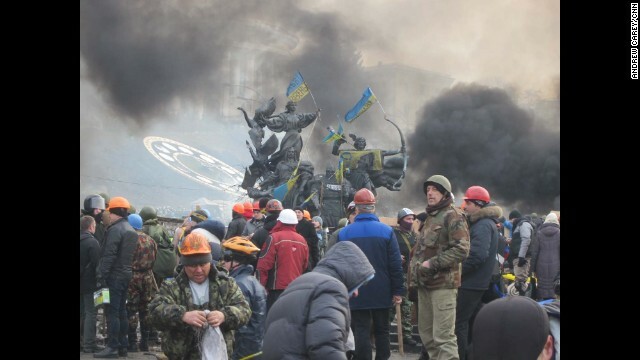 Photo by CNN's Todd Baxter on February 23. 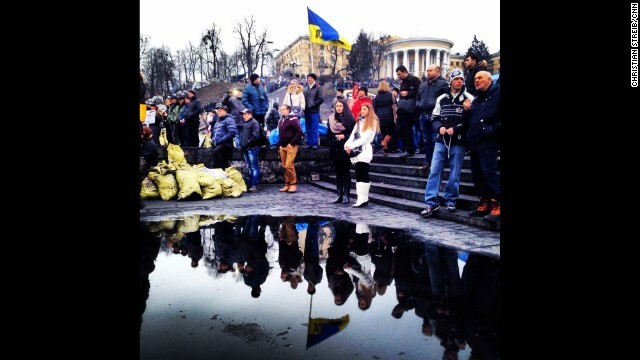 KIEV, UKRAINE: Ukrainians are reflected in a puddle as they gather to mourn the dead in Maidan Square on February 23, after protesters succeeded in forcing President Viktor Yanukovich out of office. Photo by CNN's Christian Streib. Follow Christian on Instagram at instagram.com/christianstreibcnn. KIEV, UKRAINE: "Anti-government demonstrator in makeshift riot gear (February 22), a member of several protection units set up by the organizers of the occupation of Maidan Square." - CNN's Christian Streib. Follow Christian on Instagram at instagram.com/christianstreibcnn. 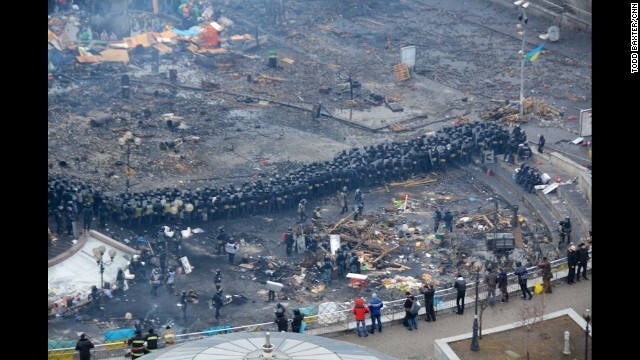 KIEV, UKRAINE: Defected policemen and anti-government protesters at barricades together in central Kiev on February 21. 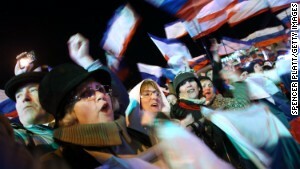 Photo by CNN's Fred Pleitgen. Follow Fred on Instagram at instagram.com/fpleitgencnn. KIEV, UKRAINE: Anti-government protesters clash with riot police in central Kiev on February 20. Photo by CNN's Todd Baxter. KIEV, UKRAINE: Riot police face anti-government protesters during clashes in central Kiev on February 20. Photo by CNN's Todd Baxter. KIEV, UKRAINE: After the deaths of 25 people during clashes a day earlier, Ukrainian protesters prepare to stand and fight again on February 19. Photo taken by CNN's Andrew Carey on February 19. 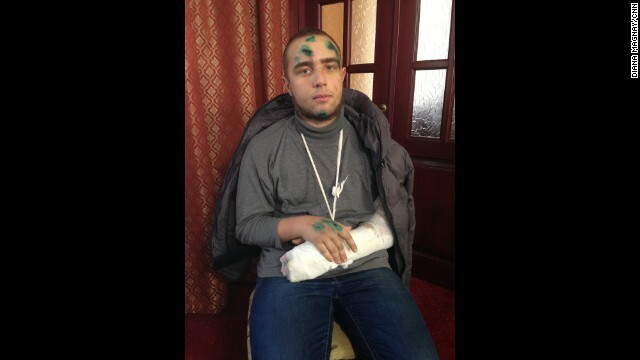 KIEV, UKRAINE: "This 17 year old protestor was taken by police as he was watching the clashes (January 23) while taking iPhone photos. He was stripped naked, beaten, stabbed in the thigh and his arm was broken. He faces eight to fifteen years in jail for taking part in a mass demonstration. 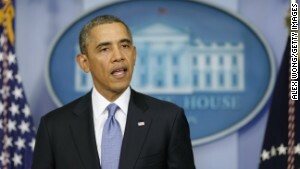 The government has labeled those taking part in the violence as 'terrorists'." - CNN's Diana Magnay. 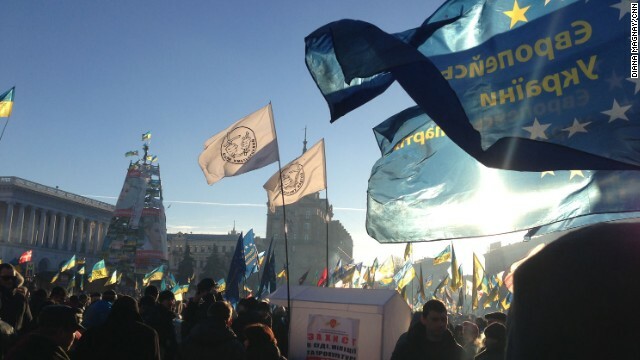 KIEV, UKRAINE: Pro-Europe protesters pour into Independence square on December 14. Opposition supporters have been camping since Nov. 21 in Independence Square - in protest against President Yanukovich's last minute refusal to sign an agreement bringing Ukraine closer to the European Union, in favor of Russia. Photo by CNN's Diana Magnay. KIEV, UKRAINE: Ukrainian riot police storm barricades set up by pro-European Union protesters in Independence Square on December 11. 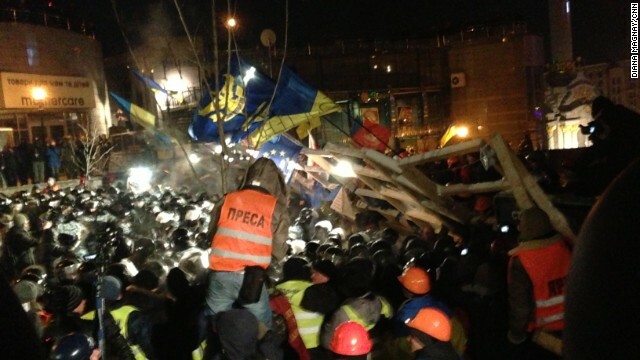 Ukrainian security forces stormed the square, which protesters have occupied for three weeks. The demonstrators defiantly refused to leave and resisted the police in a tense standoff. Photo by CNN's Diana Magnay. 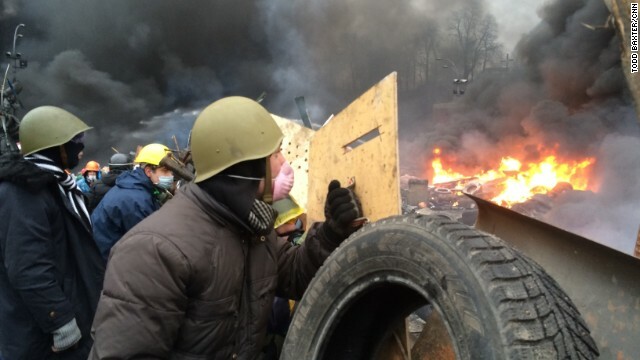 Crisis in Ukraine, captured by CNN Teams on assignment. Crimea is home to 2 million people, most of them ethnic Russian. Moscow strongly backed Sunday's referendum, which the region's leaders declared won with an overwhelming 96.7% vote in favor of leaving Ukraine. Russian lawmakers have said they will welcome Crimea with open arms, but members of the ethnic Ukrainian and Muslim Tatar minorities had said they would boycott the vote. Yatsenyuk said Moscow appeared ready to attempt a similar play in other Russian-speaking areas of Ukraine, starting with demonstrations by what he called "political tourists" with foreign passports. 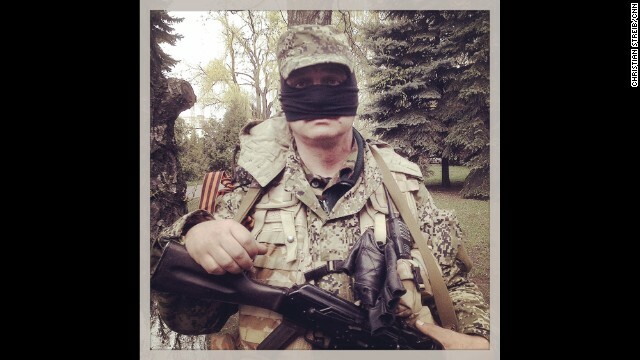 "Look (at) the last rallies that happened in Donetsk and in Kharkiv and in Lugansk," he said. "They gathered from 500 people up to 4,000 people. But they expected to have 50,000 people. So we talked to the people. We tried to address this issue in the right manner, trying to convince Ukrainians that the biggest asset we have is our country." Andrii Parubii, the secretary of the Ukrainian parliament's National Security and Defense Council, told lawmakers the protesters included "elite special units that are trying to arrive to Ukraine with weapons, and that are trying to implement a joint plan of the same scenario that was conducted in Crimea." READ: Opinion: Can West make Putin blink? Editors' Note: This article has been edited to remove plagiarized content after CNN discovered multiple instances of plagiarism by Marie-Louise Gumuchian, a former CNN news editor. CNN's Susannah Palk, Stephanie Halasz and Yon Pomrenze contributed to this report.